Have students independently complete the Product History activity using this Quaker Oats YouTube clip. Note: I am not paid to sponsor or promote Quaker Oats, but liked how this clip explained the history behind oats and their product and it also was a way to introduce a little advertising information. Since the intro activity shared some history about oats, I wanted my students to learn more about the nutritional qualities and benefits of this whole grain food. To do this, I assigned them the Oats…Nutritional Qualities & Benefits assignment with linked resources. Since this is used with junior high students, linking resources helps with time management, helping to keep students on track. Otherwise, some students would waste an entire period looking for resources/answers! Depending on your time frame, you can either go over the answers to the assignment as a class, discussing the answers or you can collect for a grade. Now go back to the Quaker Oats Television Ad Contest clip and review the types of oat recipes shared throughout the video. One of them specifically references “oats in a jar” or “overnight oats”. Preface the lab/project by sharing with students that the contest has been offered in the United States and adapted to this hashtag #ShowMeYourOvernightOats! Explain that each student is going to create a customized recipe to enter! Be sure to go over the parts and ingredient amounts used in a serving of overnight oats prior to creating and preparing their recipe/product. This can be found in the attachments below. I have my students use half-pint canning jars since I already have them for the “Banana Bread in a Jar” lab. During the planning stage, students select their ingredients, write their recipe in the “jar” and create a #title. If you don’t have canning jars, use mugs or bowls and cover with plastic wrap before refrigerating. Once students have planned their overnight oats recipe, I compile a list of ingredients that I need to purchase and then students actually build their jars and take photos for their Recipe Entry Slide. After refrigerating overnight, students actually eat their creation. These can be eaten hot or cold, so if students are eating cold, they simply add their desired toppings and consume. If eating hot, they warm them up in the microwave or on the stove top and add desired toppings before consuming. 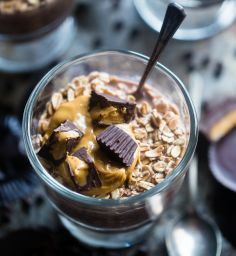 For the Recipe Entry Slide, students must create a slide that includes their first name and last name initial, #title, their written recipe and a photo of their overnight oats. See the sample slide below. Once finished, students submit the slide to me via Google Classroom for grading and they also upload to a Padlet board I created for recipe curation so they can access all of the recipes made by their peers. Hi Kim! Is this an actual contest in the United States right now? Thank you! Love the ideas! Hi Jessica! The contest only runs in the UK but I have my students look at it hypothetically as though it were running in this country! Sorry for the confusion!